Bee Removal and Pest Control Services | Full-Service Extermination Solutions! Affordable Pest Control Services near Troy MI, helping residents across Southeast Michigan! Are you looking for an exterminator to remove carpenter bees? Carpenter bees are a common damaging bee species found in Michigan. Are you looking for more facts about carpenter bees? There are two genera of carpenter bee: the large carpenter bee and the small carpenter bee. The large form of this pest is the one most likely to do damage to your home. 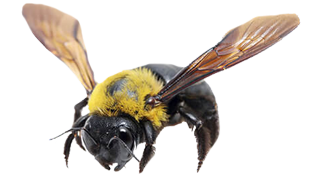 Large carpenter bees are anywhere from 12-25 mm long and are similar in size and appearance to bumble bees. They range in color from black to greenish black to metallic or purplish blue in color, with the males featuring yellow sections of their face. They also have yellowish hairs on their legs, thorax, and abdomen, which are not as thick as those of bumble bees, giving the large carpenter bee a glossy look. The small carpenter bee is darker in color, it’s scant body hairs giving it a metallic appearance. Many have yellow markings on their face and body. What does a carpenter bees nest look like? Carpenter bees nest inside of the wooden structure of homes and buildings, often drilling a 1/2 inch round hole and leaving sawdust behind. These bees then create tunnels from the original nest hole, potentially causing great structural damage to your home. What is typical behavior of carpenter bees? Large carpenter bees do not actually eat wood. Rather, they excavate dry, weathered wooden objects such as doors, railings, decks, windowsills, untreated poles, and fences. The wood of choice for these bees includes Cyprus, oak, pine, redwood, and fir, especially when the wood is unpainted, unfinished, and not covered in bark. Females have strong mouthparts that are capable of chewing the wood to make an entrance. The galleries of these bees are labor-intensive and may increase several feet over several years. These bees feed on plant pollen and nectar. Small bees also eat plant pollen and nectar. They erect their nests by excavating stems and twigs and, in the springtime, further excavate their homes to create a brood nest much like that of large carpenter bees. Do carpenter bees sting? Do carpenter bees bite? Male carpenter bees are unable to sting. However, female carpenter bees do sting, but only when seriously provoked. Carpenter bees can bite, but they do not bite humans. What is the difference between carpenter bees vs bumblebees? Carpenter bees and bumblebees are similar in size and general appearance. The biggest difference between the two is that carpenter bees are not social insects, colonizing in much smaller groups in more hidden places. You are likely to see large groups of carpenter bees near the eaves of your home or the top of a building. Additionally, carpenter bees are mostly hairless on the abdomen, which is shiny black in color, while the abdomen of a bumblebee is covered in hairs. How can I tell if I have Carpenter bees? Carpenter bees leave a lot of evidence of their presence. Their entrance into their nest looks like a 1/2 inch drill bit was used to drill a hole in your home, and they leave sawdust on the ground where the hole was drilled. They also leave behind a yellow trail at this entrance, which is a combination of bee excrement and pollen. Males are extremely protective of their territory and, although they do not sting, their flight pattern could be described as aggressive. Another indication is the presence of woodpecker holes near the bee’s gallery. Woodpeckers eat these bees and often cause more damage to your home in search of their prey. Learn more about common bed bugs including cockroaches and centipedes. Hi-Tech Pest Control has a wide variety of commercial Integrated Pest Management programs. We also offer residential IPM programs to fit your preventative pest maintenance needs. Call us at 248-569-8001 to start your Integrated Pest Management program today! From Pest Heat Treatments to Chemical Pest Treatments, we are your one-stop source for pest maintenance. Whether it crawls, flies, bites, or destroys — no matter how in-depth your pest problem is, Hi-Tech Pest Control can solve it! We pride ourselves on doing the jobs those other guys can’t do. Plus, with a 6-month money back guarantee and a free inspection, you have nothing to lose. Call Hi-Tech Pest Control today at 248-569-8001 to schedule your free inspection!